There are two panchamis (fifths) in the Hindu lunar calendar’s waxing fortnight that have (had?) a special attraction for the children of the muhallas of Kashi: Vasant Panchami (Maagh) and Naag Panchami (Shravan). Naag Panchami is the day on which the hooded serpents (cobras) are worshipped. In Kashi they have always been important and their importance has reasons that go deeper than a man’s reflexes or the unconscious. Their being the preferred ornament of the Lord of Kashi – Mahadev – automatically makes them important. They may not be very much welcome inside the house in their wild and free form but they are very much expected and welcome in the galis for their customary darshan when the devotee is secure in his knowledge of the removal of their poison teeth, and of their movements totally under the control of an intermediary – the snake charmer. That used to be the case in the pre-Menaka, pre-PETA days of Kashi. Whether there’s even one person pursuing the profession now or not, I’m not sure of. I’ll definitely ask my sources, reliable as ever, on the spot for their real time feedback on that day tomorrow. Till then, let’s return to the idea of Naag Panchami of the olden days – the days of snake charmers and their Oriental wind instrument of a been that would fill the air from early in the day till evening. 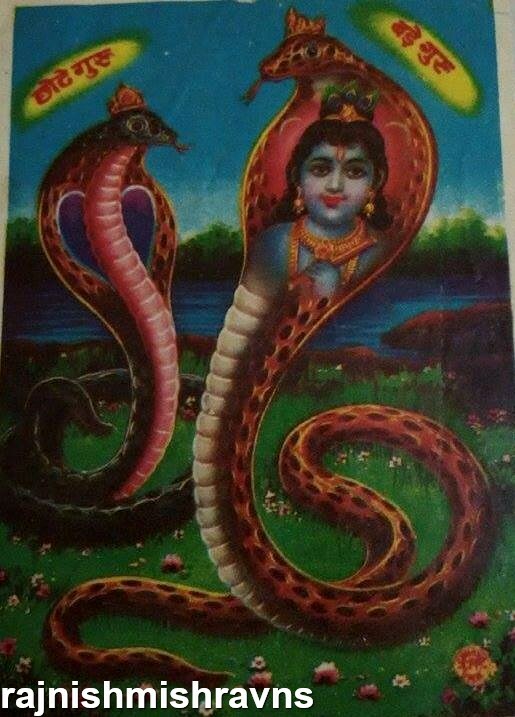 That day used to be special because, in contrast to the other days of the auspicious darshan of the snakes, the days on which they were important due to their association with Shiva, on their panchami they were important and were worshipped qua the species – for the power over life and death that they possessed. People believed, and probably still do, that snakes are partial towards milk. Therefore, they’d carry milk in saucers and offer it to the the snakes in the gali. Some even believed that points thus deposited in their snake’s account through one particular snake might be withdrawn in the hour of need of protection from any other member of the family. Then, there was the formula for the protection of the whole house. Children used to make rounds of the galis shouting in their sing-song voice: Chhote guru ka, bade guru ka, naag lo bhai naag lo i.e. Buy the snake (posters/cards) of the younger and the older Masters. As far as the identity of the gurus, nobody was bothered about it back then (I came to know later that the famous grammarian Panini was one of them, yet, I could never link that sage with a snake by any stretch of imagination). It was more of a mantra the kind that the amulet makers chant while casting spells for their protective amulets – that we don’t have or feel any need to know or understand. Its very chanting was reassuring. So, the nearly ritual selling of those plain posters used to be an important part of the day’s schedule. People would buy them, or later, their more modern and attractive (gaudy, say some) multi-coloured counterparts early in the day so that flowers and vermillion paste mixed with uncooked rice grains could be offered to the same in puja. After that, those little poster with their ubiquitously and prominently displayed hooded snake performing one role or the other, would be fixed with the home made grey glue or with its marketed packeted green version, on the door panes, door frames, or on the wall by the door frame. The idea behind the practice was that they’d guard that entrance and no snake would enter the house, at least form the door thus protected. It actually worked! It worked for decades for our house, and for moist of the houses in the neighbourhood. Seriously, don’t you always expect to find snakes in a densely populated locality with pukka houses over a century old, and the age of human habitation even older? So, there’d be the ceremony of sticking those posters after the puja in the small “temple-room” of the house and then, throughout the day, snakes of various types and ages and lengths and girths would make their appearance on to the pageant area of the gali. In a gali, narrow by nature, there’s a clearing, a sudden widening, that naturally tends to draw gatherings towards it like a huge circular magnet. It is not the case in Kashi only. I have found similar public spaces in the network of galis in Udaipur too – in the walled city and in the newer sections too. So, that clearing in the generally narrow gali functioned as a stage for all sort of performances and in those pre-cable/dish TV days of my childhood, performances were many, varied and rivettingly interesting. Back in my time there used to be the monkey shows, the bear shows, the ubiquitous and regular snake shows, the comparatively rare human magic and contortion shows that sometimes had the stereotypical tightrope walker too. All those spectacles in the multiply used public spaces of our narrow lanes, barring the prohibitively scorching summers of the North, provided us with a really interesting day life. By “us” I mean mainly the school going children and mothers, grandmothers, aunts and sisters who used to stay at home performing their myriad home-making roles. In the gali would emerge the snake charmer with his cloth sack on his shoulder, or in case of a more industrious and market savvy show man, on both his shoulders (and it was never a woman), his trademark been playing – a la pied piper of Hamelin in his twentieth century benevolent avatar.